In 2010 renowned drummer Mark Fletch put together a band compromised of some of the most innovative players in British music. That band became Fletch’s Brew. Across evolving line-ups and with many of Fletch’s long-time collaborators joining the band, the central ethos of Fletch’s Brew remains commitment to spontaneity. Whether playing original compositions or new arrangements from across the jazz cannon, the band’s style floats seamlessly between the idioms of fusion, funk, bop, reggae and rock. This album reflects aspects of all of these styles and features all of the players who have been part of the Brew over the years. 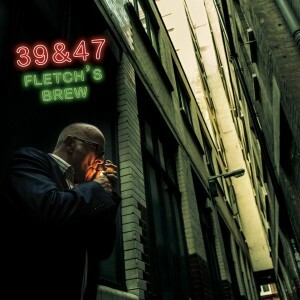 In 2014, Fletch’s Brew released their debut album ’39 & 47’. number of different projects. Musically, 39 and 47 offers a great deal of variety to listeners. Half of the tracks are completely improvised, but at no time are they lacking in the heavy grooves the Brew have become known for. Also featured are original compositions by Carl Orr and Freddie Gavita as well as Gavita’s arrangement of Herbie Hancock’s ‘Fat Albert Rotunda’ and the band’s signature tune, a funky arrangement of Wayne Shorter’s ‘Beauty and The Beast’. 39 and 47 features playing which is virtuosic but also accessible, it is a concept album which tells a story about the history of British jazz, the life of the musicians who helped make it and the places that they continue to call home. Fletch’s Brew play regularly at Ronnie Scott’s and on 39 and 47 they invite you to take the journey which led them there.